The North Carolina Beard and Moustache Club, founded by Andrew Dudek (far right), held its inaugural meeting recently in at a pub Greensboro. Fourteen charter members attended. The members chose Jason Wiggs (back row, third from left) as March Beard of the month. turn make into buttons, tee's, stickers, and pins. The next meeting is April 3, and future meeting are scheduled for the first Tuesday of each month. The club will supply fake beards and moustaches for the ladies and enthusiasts who would like to join its evenings. Oh yes, people drink beer at these meetings. 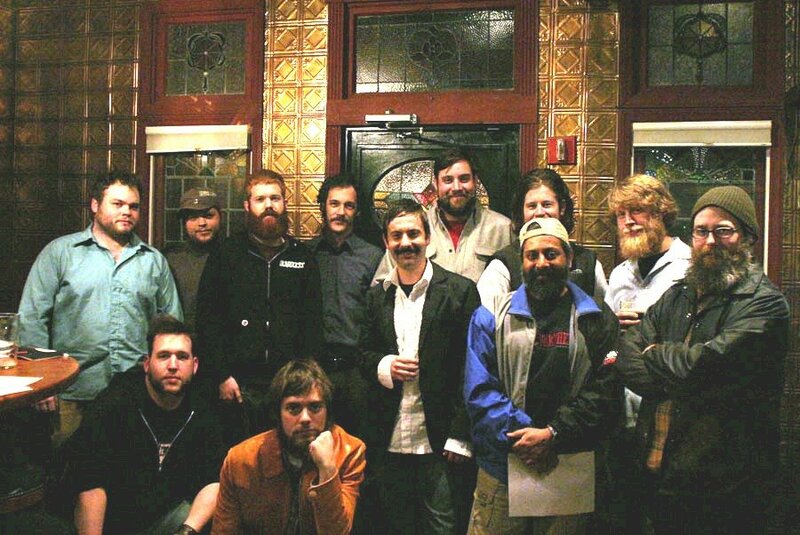 I wish we had a Beard and Mustache Club in Michigan. I started a Yahoo Group called BeardGrowers_MI. So far, no interest. PS: I tried the url and it worked. Also, you can see a picture of my beard by going there. I haven't figured out how to put my picture on my blog yet. As you can see, I'm not very computer savy yet. I'm From Charlotte, How do I get involved in tne NCBMC? ps - i recommend the documentary "growing a beard" if you haven't already seen it. This is a special invitation to the NC BMC. Ya All! come on up for the contest on Saturday. Form a car pool and make it a party. Hi I'm new to BTUSA and I was wondering if there are any Beard Clubs in Charlotte, NC. And if not would anyone be interested in starting one. My email is nardotony@gmail.com. feel free to contact me there. Thanks and grow well. A refreshingly hilarious look at the usually over-serious highway patrol. I know at least 2 guys who grew a mustache for laughs after watching that movie. A shining performance by the Governor of Vermont. I had no idea there are so many beard and mustache clubs all over the country. I am going to start growing mine out again. Unfortunately, I have no idea what the track names are , but I think that the information of this band is really good, I have been in many of their concerts around the USA!